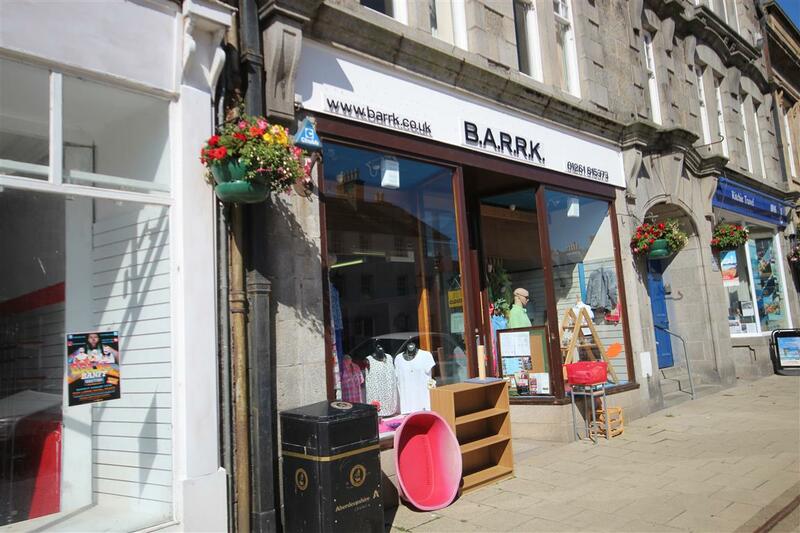 Commercial premises comprising: Front shop. Rear Shop. Store. wc. Upper sales area. Office. Price around £140,000 Entry by arr. Viewing contact solicitors. (EPC band - F). This former shop premises are for sale due to retirement of the current proprietors after 37 years in business. The premises are centrally located with good window frontage. The premises boasts spacious floor areas spread over two floors and has been well maintained by the current proprietors. In addition, there are 2 handy stores and a toilet located on the ground floor. The premises has potential to be turned into residential accommodation should the relevant planning permissions be applied for and obtained. FRONT SHOP 11.00 x 4.75 (36’1" x 15’7") A bright front shop with good window display space and generous retail display areas. Counter. Steps lead to the rear shop, store and toilet. Stairs lead to the first floor retail sales area. REAR SHOP 4.35 x 2.96 (14’3" x 9’8") With shelving and storage space. REAR STORE AND TOILET Shelved lockable store. Toilet with WC and wash hand basin with water heater over. FIRST FLOOR SALES AREA 18.93 (L) x 10.41 (W) (62’1" x 34’2") Exceptionally spacious sales floor area. Office space. OFFICE 3.60 x 2.94 (11’10" x 9’8") Shelving and rear window. INCLUDED IN THE PRICE The shop will be sold with all fixtures and fittings. ADDITIONAL INFORMATION Please note that this premises will be tenanted for 5 years from 1st October 2017. SERVICES Mains electricity and telephone. RATEABLE VALUE The current rates for the property are £6,200. It is believed that any potential purchaser will benefit from Small Business Rates Relief, however potential purchasers will require to make their own enquiries with the local assessors department in this regard. LOCATION Banff is a historic County Town situated at the Estuary of the River Deveron on the Moray Firth Coast and retains a busy and prosperous feel. The town provides an excellent range of professional, shopping and leisure facilities including 18 hole Golf Course, Swimming Poll and Leisure Harbour Banff provides both Primary and Secondary Schooling. Excellent salmon fishing is available on the River Deveron with a wide range of both land and sea based sports available nearby. The City of Aberdeen with main railway station and airport is within reasonable commuting distance, approximately 46 miles.